“Plan for the worst, hope for the best”. A phrase I am sure lots of us have heard over the years. Despite the vast wealth of knowledge and technology in the world of safety, things inevitably still do go wrong. There are many, varied reasons for this, which is why we really should think of the “worst-case scenario” so we can plan accordingly. Some would ask why we should plan for an emergency in the first place. Surely, it’s the job of the emergency services to come and save us from disaster? This is great – unless of course we are on a boat in the middle of the ocean – a boat which is sinking. No problem, the navy and coastguard will come and save us. Unfortunately, they are many days away from our location. Again, fine, we can wait in the lifeboats. Wait, what’s that? We haven’t got any because we didn’t think we’d need any?! The point here is we first have to save ourselves before others can help. So, emergency services and other third party rescue teams should only be part of the measures to tackle an unfolding drama. This article will focus on chemical safety, but first, let’s look at what is considered an emergency. Emergencies are usually situations where something bad has happened, and there needs to be some kind of rapid response, to prevent escalation. It could be something relatively simple, e.g. during a meeting a colleague complains of severe chest pain and struggles for breath, so an ambulance is called and he is taken to the nearest hospital for treatment. Unfortunately, it could also be something far more complex. A worker spills a chemical, he breathes the fumes, and collapses. A colleague rushes to help him, but he is also overcome. The fumes then find some kind of ignition source, causing a fire. This fire is fanned by the wind towards an explosive material. We now have a major disaster on our hands; local fire and rescue services struggle to contain the situation. Specialist hazmat teams have to be called in, which takes time. So, a simple spillage of liquid ends up killing multiple people and causing wide-spread issues, because our only emergency procedure was to call the emergency services. There are plenty of things we could do to prevent or mitigate escalation of a situation. Usually, this is where we would now discuss the importance of planning, drills and tests, training, coordination with emergency services and other third parties. This article, however, will look at hazardous substance related issues such as spills and releases of liquids, fumes and other forms of chemicals and materials. The main focus of our discussion today will be measures such as eyebaths and showers. Let us first do some ground work, and look at the problem: the substances themselves. Hazardous substances come in many different forms. While most people would recognise the chemical forms known as liquids, solids and gases, we also need to worry about fumes, mists, vapours, and even dusts. By understanding how a substance is formed, we can know how it will react in certain situations, and how to best handle, store and make use of the substance. Some substances will react violently when exposed to, or when coming into contact with others, e.g. when trying to extinguish an oil fire using water. Other substances – such as mercury, cyanide and strychnine, just to name a few – can be lethal in the tiniest of quantities. So knowledge is a key part of our response to a hazardous substance incident. This knowledge can be gained from something as simple as Chemical Awareness training, or by looking at the SDS (Safety Data Sheet) provided with the substance. Even the symbol on the label can tell us straight away how bad a substance might be. 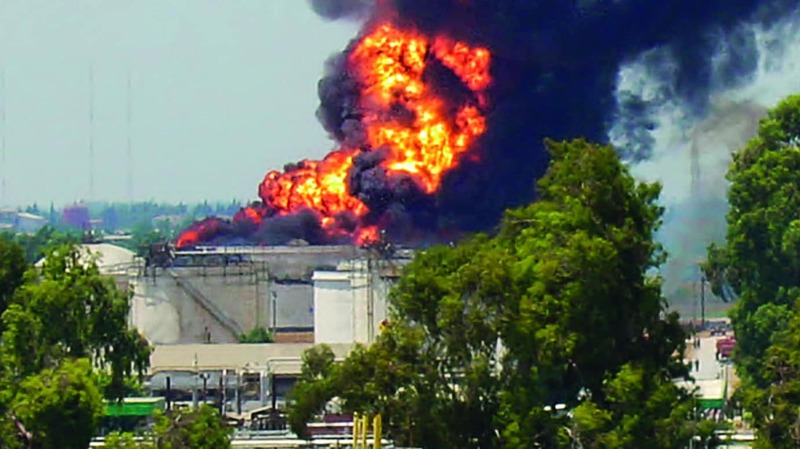 Chemical accidents can vary in nature: from a simple spill that can be mopped up, to extreme cases such as explosions and fire. One extreme example would be the fire, and resulting explosions, at the Chinese port of Tianjin in 2015. This is a good example of poor storage and not understanding chemicals. An initial fire was tackled by firefighters, unaware of the chemicals being stored in the area, including sodium cyanide, ammonium nitrate, and calcium carbide. By spraying water onto the chemicals, the calcium carbide reacted, producing highly flammable acetylene gas. This caused a massive explosion, and the resulting chain reaction with all the other chemicals produced an even larger explosion, leaving 173 dead and 797 injured. Another extreme example would be the Bhopal incident in India, back in 1984. Due to a leak, a chemical called methyl isocyanate was released into the atmosphere. Figures do vary, but thousands died in their sleep, and thousands more were killed during the intervening period. Allegedly, problems such as miscarriage, cancer and birth-deformities still occur to this day, due to poisoning of the ground and water supplies. While these might be extreme examples occurring in industrial areas, chemical accidents can happen anywhere. Just in March 2017, a school in the Philippine capital of Manila had to close after staff and students were accidently exposed to several chemicals, including mercury. In April the same year a truck in Atlanta, USA, carrying benzoyl chloride was involved in a collision with another vehicle, causing the truck to overturn and spill the chemical. While the only injuries were from the initial collision, there was still major disruption, as the highway was totally closed for several hours while hazmat teams were called in to deal with the incident. In another example, in Illinois in 2000 a video shows a state trooper responding to a truck roll-over. The truck was allegedly carrying anhydrous ammonia. As the police officer rushes to the scene, his dash-cam captures the events as they unfold. He sprints towards the truck, but is overcome by the chemical fumes. The effect is instant; he does not even have time to call for help on the radio before he collapses. While this video is allegedly a mock-up used for training purposes, it still has a big impact on the viewer. These examples highlight the fact that we should always be vigilant of chemical incidents no matter where we are, as they can occur anywhere and at any time. Recently, the new GHS (Globally Harmonised System) for hazardous substances and chemicals was introduced to the world, so any substance and the paperwork that comes with it should be instantly understandable – regardless of whether you work in Spain, Germany, the UK, or further afield in Africa, the Middle East and Asia. This information includes the chemical make-up of the substance, date of manufacture, handling and storage instructions, and so on. More importantly though, it gives critical first-aid advice on how to treat victims who are accidentally exposed. As an example, someone may spill a large quantity of liquid on their body. A natural reaction would be to use water to wash the chemical off the victim. The water, however, may simply spread the chemical around, or even worse, react with it, turning it into something even worse. Another scenario may be that we see someone collapsed in a work area. Our instincts take hold, and we rush over to help, realising too late that there are chemical fumes in the air that we cannot see, taste or smell. We breathe in these fumes, collapse unconscious to the ground, and become a victim ourselves. This knowledge is key to preventing the deterioration of a situation. So, now we have the information, what other steps should we take? As mentioned in the previous paragraph, we can make things far worse despite the best of intentions. It might well be fine to use water to clean off one chemical, but not another. So let us consider other methods. Eyebaths and eyewash stations are one particular method. The clue is in the name: at these stations we drench the affected victim’s eyes with some kind of liquid to remove a hazardous substance, or counteract its effects. The liquid in question could be sterile saline solution, treated water, or even something more exotic such as Collyrium. What you use will again depend upon the type of substance you are trying to deal with. For example, if something acidic was involved, we would need to use something that would neutralise the acidity. These washes and stations could be in the form of some kind of bottle, which is simply opened and poured over the victim’s eye. They could also look like green-coloured drinking-water fountains or sinks, in which water is sprayed onto the victim’s face from small showerheads. This is all well and good for dealing with the eyes and other facial problems, but what if other areas of the body or even the whole body is affected? One small bottle of saline solution is simply not going to be sufficient to do the job. This is where the emergency shower/safety shower comes into play. These again can range from simple showers like those that you might find on a campsite or in the bathroom at home, to fullblown, fully contained, automated decontamination systems, such as laboratories. They can be operated manually, with the user simply pulling a handle by hand, or may be automatic through the use of sensors, persons standing on pressure valves and so on. Another big advantage that they have is that they can be fixed to a large tank or mains liquid supply, meaning there is plenty of available fluid for washing the affected areas of the victims. According to Law, depending upon the jurisdiction you work in, safety showers also have to release water or liquid at certain pressures to ensure the liquid is released with enough force. This is particularly useful if the victim is covered in a copious amount of substance, or if the substance is difficult to remove, such as is the case for dusts and fibres. These sound like excellent solutions, but there are other things we need to be aware of. The victim may be in incredible pain, or may not be conscious. This means they will not be able to help themselves by opening bottle caps, or be able to see where emergency stations are located. This also potentially puts the rescuer at risk, having the substance transfer onto them through contact with the original victim. The victim may also be allergic to certain ingredients within eyewash bottles, so we then wash the chemical out of their eyes, only to create another medical issue to deal with. Due to the pressure, showers may accidentally force materials into victim’s eyes and skin, escalating their exposure to the hazardous substance – think shampoo in the eyes, but on a whole new level. They may also leak through loose connections, damaged pipework and so on, losing the critical pressure they require. The water or liquid that is ejected could also be at the wrong temperature, leading to heat or cold problems for the victim, such as severe burns or hypothermia. Just like any other piece of equipment or asset, emergency showers and eyewash stations can fall into disrepair and/or malfunction if not inspected and maintained on a regular basis. Some safety showers in particular would require specialist servicing, maintenance and testing, which could be both costly and time-consuming, depending upon the specific system you use. The liquid contained within eyewash bottles can expire, reducing their effectiveness. You would not eat food after it’s expiry date, so why would you use out of date eyewash? These items may even be misused, whether deliberately or accidentally. People who do not understand their purpose may mistake eyewash bottles as drinking water, for example. Showers may be used for normal washing purposes, exposing the workers to contaminants within the shower that still remain from a previous incident. Think also about the location of these items. Are eyewash bottles kept hidden away from the curious eyes of children, or mounted high enough out of their reach? Are eyewash stations and showers located close-by to hazardous areas, where they can be accessed quickly when needed? What about doors and doorways? The last thing we want is for an employee to access an eyewash station and have the effects of the chemical successfully removed, only to have them injured by someone swinging a heavy door into them. Would these items be better placed outside, to prevent victims Emergency Procedures | Article being brought into buildings and contaminating everything in the area along the way? We have two common chemical safety solutions here: one very simple, one a bit more complex. In terms of their use, both would require very little training, and usually come with simple, easy to understand instructions. These can be mutlilanguage booklets, or pictures/signs showing the user what action to take. Would you require one of these measures, the other or both? This again will vary greatly depending upon the exact circumstances you work in. You have to get the bigger picture and all the information you can, so you can make the correct decisions. Think of all the substances involved; their location, handling, storage and use; the potential number of employees and other persons who may be exposed or affected; and the general work environment you are in. The devil, as some might say, is in the detail. If you are not sure of anything, seek help from other companies and entities who may use the same substances you do. Also, approach the substance manufacturers directly, or ask a chemical safety expert or consultant. A person’s accidental or unwanted exposure to hazardous substances cannot always be eliminated, but we can mitigate the consequences of these unfortunate incidents. While chemical safety is a wideranging subject, like most others in the health and safety field, just adding one of the above assets would make a small but significant step towards your workplace and workforce becoming happier, safer and more productive.